Large scale: over 300k examples (minutes) from 60 users. Everyday devices: sensors from smartphone (iPhone/Android) and smartwatch. Diverse sensors: heterogeneous measurements from different sensors. In-the-Wild: data was collected from users that were engaged in their regular natural behavior. Rich context: annotations are combinations of context labels from a large vocabulary. Publicly available: everyone is invited to download the dataset for free and use it (conditioned on citing our original paper). This dataset was collected in 2015-2016 by Yonatan Vaizman and Katherine Ellis with the supervision of professor Gert Lanckriet. Department of Electrical and Computer Engineering, University of California, San Diego. The ExtraSensory dataset contains data from 60 users (also referred to as subjects or participants), each identified with a universally unique identifier (UUID). From every user it has thousands of examples, typically taken in intervals of 1 minute (but not necessarily in one long sequence, there are time gaps). Every example contains measurements from sensors (from the user's personal smartphone and from a smartwatch that we provided). Most examples also have context labels self-reported by the user. The users were mostly students (both undergraduate and graduate) and research assistants from the UCSD campus. 34 iPhone users, 26 Android users. 56 right handed, 2 left handed, 2 defined themselves as using both. Diverse ethnic backgrounds (each user defined their "ethnicity" how they liked), including Indian, Chinese, Mexican, Caucasian, Filipino, African American and more. The users in ExtraSensory had a variety of phone devices. iPhone generations: 4, 4S, 5, 5S, 5C, 6 and 6S. iPhone operating system versions ranging from iOS-7 to iOS-9. Android devices: Samsung, Nexus, HTC, moto G, LG, Motorola, One Plus One, Sony. The sensors used were diverse and include high-frequency motion-reactive sensors (accelerometer, gyroscope, magnetometer, watch accelerometer), location services, audio, watch compass, phone state indicators and additional sensors that were sampled in low frequency (once a minute). Not all sensors were available all the time. Some phones didn't have some sensors (e.g. iPhones didn't have air pressure sensor). In other cases sensors were sometimes unavailable (e.g. location services were sometimes turned off by the user's choice, audio was not available when the user was on a phone call). The following table specifies the different sensors, the format of their measurements for a single example and the total number of labeled examples (#ex) and users (#us) that have measurements from each sensor. Calibrated version of gyroscope (tries to remove drift affect). Unbiased version of magnetometer (tries to remove bias of the magnetic field created by the phone itself). Gravitation direction (the magnitude is always 1G). User-generated acceleration (raw acceleration minus gravitation acceleration). Estimated orientation of the phone. Rotation vector or attitude vector at every time-point. We have processed and cleaned the labels that were self-reported by users. Labels with prefix 'OR_', 'LOC_', or 'FIX_' are processed versions of original labels. To better understand how the data is structured, and how to use it, check out our introduction tutorial. Main activity. Labels describing movement or posture of the user. This category is mutually exclusive and the possible 7 values are: lying down, sitting, standing in place, standing and moving, walking, running, bicycling. Secondary activity. Additional 109 labels describing more specific context in different aspects: sports (e.g. playing basketball, at the gym), transportation (e.g. drive - I'm the driver, on the bus), basic needs (e.g. sleeping, eating, toilet), company (e.g. with family, with co-workers), location (e.g. at home, at work, outside) etc. Multiple secondary labels can be applied to an example. Some examples may have no main activity selected, but have secondary labels (e.g. when the user didn't remember if they were sitting or walking, but did remember they were indoors). On average (over the sixty users) an example has more than 3 labels assigned to it. On average a user's label usage distribution has an entropy of 3.9 bits, which roughly mean that a typical user mainly used ~15 labels during the participation period. The following table displays the labels (main and secondary) and specifies for each label the number of examples that have the label applied and the number of users that used the label. Labels are numbered according to descending order of number of examples. Out of the main and secondary labels 103 were applied by users. Although some labels were applied very rarely they may still be useful, for instance by joining labels with logical-or operation (e.g. "running or playing Frisbee or playing baseball"). In addition there are cases where the user wrongfully applied an irrelevant label; and more commonly, cases where a relevant label wasn't reported by the user (e.g. at home). For those reasons we conducted the cleaning and provide the cleaned-version of the labels. 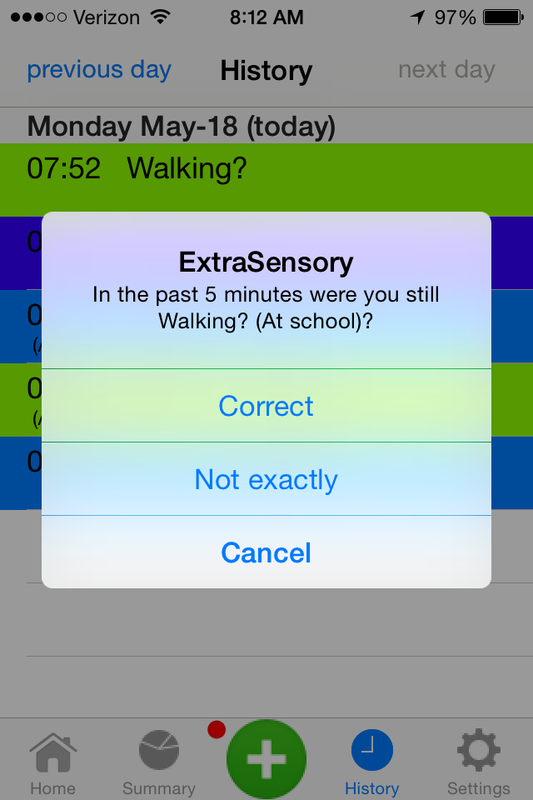 Data was collected using the ExtraSensory mobile application (see the ExtraSensory App). We developed a version for iPhone and a version for Android, with a Pebble watch component that interfaces with both the iPhone and the Android versions. The app performs a 20-second "recording session" automatically every minute. In every recording session the app collects measurements from the phone's sensors and from the watch (if it is available), including: the phone's accelerometer, gyroscope and magnetometer (sampled in 40Hz), audio (sampled in 22kHz, then processed to MFCC feature representation), location, the watch's accelerometer (sampled in 25Hz) and compass and additional sensors if available (light, humidity, air pressure, temperature). 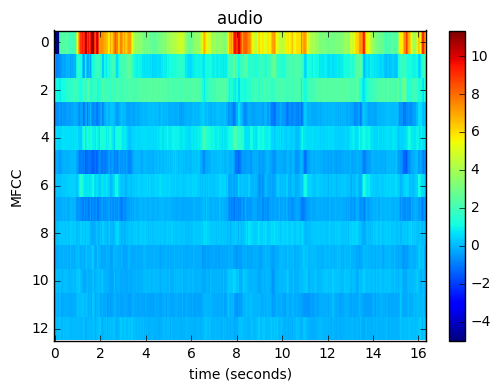 The measurements from a recording session are bundled into a zip file and sent to the lab's web server (if WiFi is available, or stored on the phone until WiFi is available). History view. Designed as a daily journal where every item is a chapter of time where the context was the same. Real-time predictions from the server are sent back to the phone and appear on the history as a basic "guess" of the main activity (with question mark). By clicking on an item in the history the user can provide their actual context labels by selecting from menus (including multiple relevant labels together). The user can also easily merge consecutive history items to a longer time-period when the context was constant, or split an item in case the context changed during its period of time. 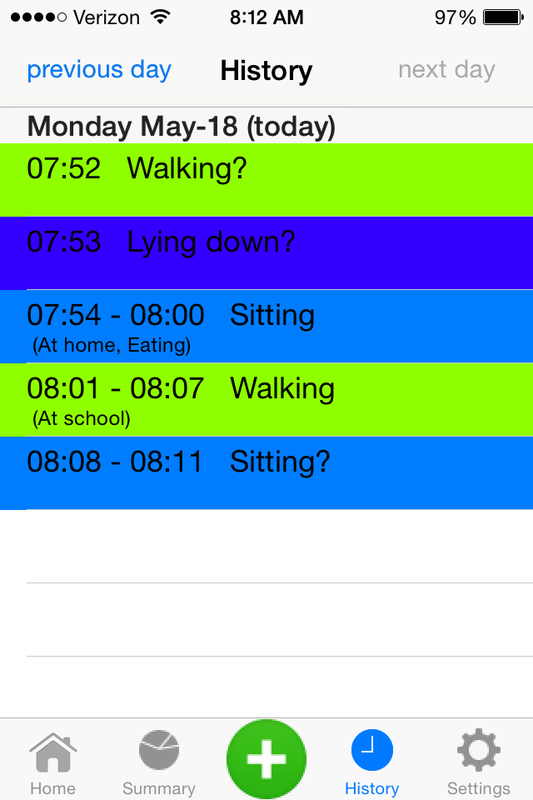 The user can view the daily journal of previous days, but can only edit labels for today and yesterday. Label selection view. The interface to select the so called 'secondary activity' has a large menu of over 100 context labels. The user has the option to select multiple labels simultaneously. In order to easily and quickly find the relevant labels, the menu is equipped with a side-bar index. The user can find a relevant label in the appropriate index-topic(s), e.g. 'Skateboarding' can be found under 'Sports' and under 'Transportation'. 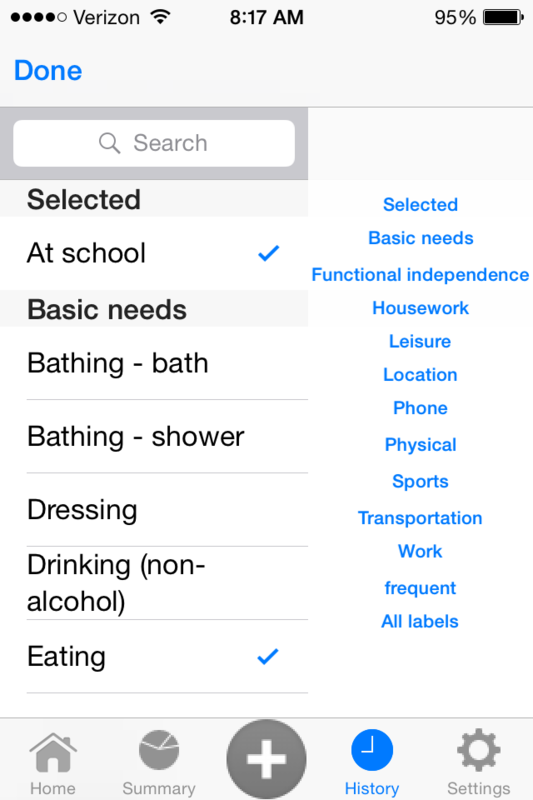 The 'frequent' index-topic is a convenient link to show the user their own personalized list of frequently-used labels. Active feedback view. The user can report the relevant context labels for the immediate future and report that the same labels will stay relevant for a selected amount of time (up to 30 minutes). Notifications. Periodically (every 20 minutes by default, but the user can set the interval) the app raises a notification to the user. In case no labels were reported in a while, the notification will ask the user to provide labels. In case the user reported labels recently, the notification will ask whether the context remained the same until now. The notification also appear on the face of the smartwatch, and if the context labels remain the same a simple click of a watch-button is sufficient to apply the same labels for all the recent minutes. The labels are also sent to the lab's server and saved with the sensor-measurements. We conducted a meeting with every participant, in which we installed the app on their personal phone and explained how to use the app. We provided the Pebble watch to the participant for the week of study, as well as an external battery to allow them for an extra charge of the phone during the day (because the app takes much of the battery). We requested the participant to engage in their regular natural behavior while the app is recording and to try to report as many labels as they can without it bothering their natural behavior too much. For full details on how we collected the dataset, please refer to our original paper, "Recognizing Detailed Human Context In-the-Wild from Smartphones and Smartwatches". If you use the dataset for your published work, you are required to cite the ExtraSensory original publication, mentioned here as Vaizman2017a. Primary data - features and labels. The zip file contains a separate 'csv.gz' file for each user in the dataset. Each user's csv file (after uncompressing the gzip format) holds all the examples for that user. From each example, there are features computed from the different sensors, and the cleaned context labels. Download the features and labels zip file (215MB). README for the features and labels data. Read the tutorial to better understand how to use the data in these files. Download this if you want to perform classification experiments and evaluate them. This has a pre-generated partition of the 60 users in the data to 5-folds and prepared text files with the list of users (UUIDs) of the train set and test set of each fold. This is the same partition that was used for the experiments in the original paper, Vaizman2017a. Use this also to see all the UUIDs and see which users used iPhone and which used Android. Download the cross-validation partition zip file. The original labels, as were self-reported by the users. This version has the full label list from the mobile app interface. The labels here have only two values: either "reported" or "not reported" (they don't have the notion of "missing labels" that the cleaned labels have). This version of the labels is less reliable (it's before cleaning), but you can still use it. It also includes additional interesting labels that were not included in the cleaned labels, like "LISTENING_TO_MUSIC__NO_EARPHONES_" or "PLAYING_VIDEOGAMES". Download the original labels zip file (970KB). 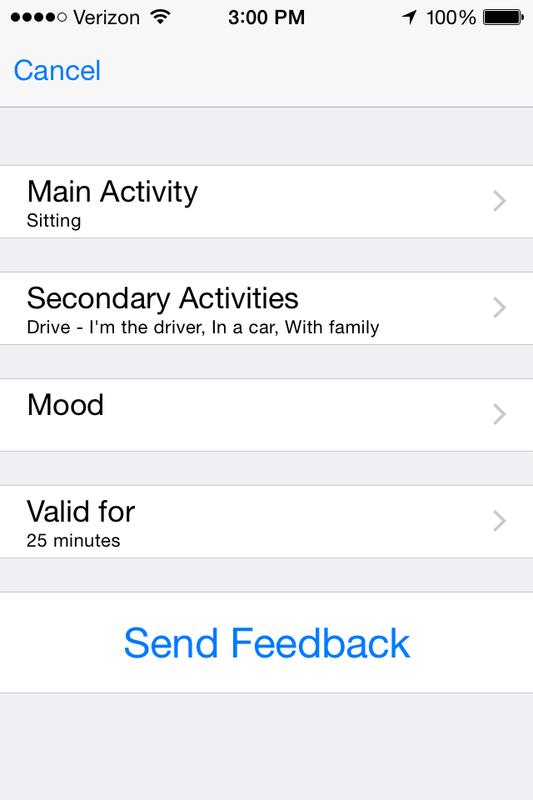 Although the data collection app (ExtraSensory App) had an option to select mood labels when annotating, we did not focus data collection on mood. We told the users that they do not have to report mood, but they can only if it is really clear to them how they felt. Only few users reported mood labels, so some of the mood label data files are filled with missing labels. Download the mood labels zip file (795KB). If you are interested in the absolute geographic location (the actual latitude-longitude coordinates) data you can use this part of the data. (The primary data has location-features that are only based on relative-location, meaning they only refer to the variability in space during the recorded 20-second window). The zip file contains a separate 'csv.gz' file for each user in the dataset, holding the latitude and longitude coordinates for the user's examples (indexed by timestamp). The original location measurements that were recorded by the mobile app during every example's 20-second window were in the form of a sequence of location-updates (new update every time there's a significant change in location). 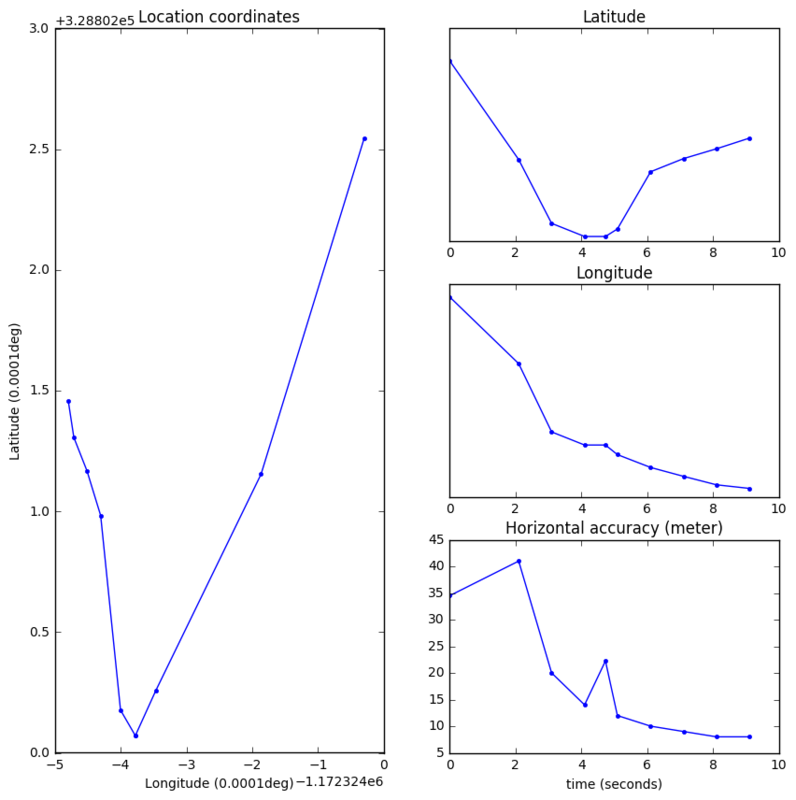 Value of 'nan' if the example has no location coordinate measurements, or if all the location updates taken in this example have poor horizontal-accuracy (more than 200meter). From the updates with best (minimal) horizontal-accuracy, take the coordinates of the latest update. Download the absolute location zip file (2.2MB). If you are interested in the signal processing stages to extract features, or feature learning, you may want to work with the raw sensor measurements. The following files are separated by sensor and inside each zip file the measurment files are arranged by user (UUID) and timestamp. Notice that not all sensors were available for recording at all times, so for some examples (timestamps) the measurement file may be missing or may be a dummy file containing just 'nan'. Be gentle on the server! The raw-measurement files are very large, so please only download one at a time. 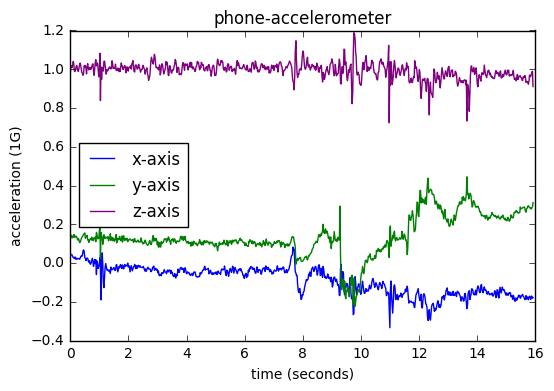 Accelerometer measurements: Download the phone-accelerometer measurements zip file (6.1GB). Gyroscope (calibrated) measurements: Download the calibrated gyroscope measurements zip file (8.7GB). Magnetometer measurements: Download the raw (uncalibrated) magnetometer measurements zip file (3.8GB). 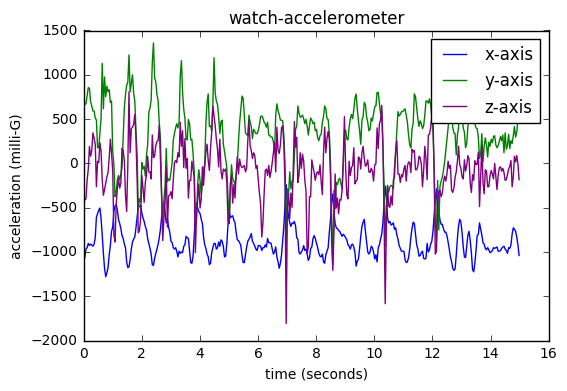 Watch-accelerometer measurements: Download the watch-accelerometer measurements zip file (800MB). Watch-compass measurements (heading): Download the watch-compass measurements zip file (88MB). Audio measurements: Download the audio measurements zip file - this is not raw audio signals, but rather MFCCs computed on the phone (11GB). Gravity measurements: Download the measurements of the estimated gravity component of the phone-acceleration. Zip file (9.4GB). Download the tutorial in i-Python notebook. Introduction to ExtraSensory (html version). View this lecture by Yonatan Vaizman for an introduction to Behavioral Context Recognition and specifically to the ExtraSensory App and the ExtraSensory Dataset. Sensor fusion The dataset has features (and raw measurements) from sensors of diverse modalities, from the phone and from the watch. In Vaizman2017a (referenced below), we compared different approaches to fuse information from the different sensors, namely early-fusion (concatenation of features) and late-fusion (averaging or weighted averaging of probability outputs from 6 single-sensor classifiers). Multi-task modeling The general context-recognition task in the ExtraSensory Dataset is a multi-label task, where at any minute the behavioral context can be described by a combination of relevant context-labels. In Vaizman2017b (referenced below), we compared the basline system of separate model-per-label with a multi-task MLP that outputs probabilities for 51 labels. We showed the advantage of sharing parameters in a unified model. Specifically, an MLP with narrow hidden layers can be richer than a linear model, while having fewer parameters, thus reducing over-fitting. Perhaps other methods can also successfully model many diverse context-labels in a unified model. Absolute location The ExtraSensory Dataset includes location coordinates for many examples. So far, in our papers, we only extracted relative location features - capturing how much a person moves around in space within each minute. We did not address utilizing the absolute location data. There may be useful information in addressing the movement from minute to minute, and incorporating GIS data and geographic landmarks. Time series modeling The models we suggested so far treat each example (minute) as independent of the others. There's a lot of work to be done on modeling minute-by-minute time series, smoothing the recognition over minutes, and ways to segment time into meaningful "behavioral events". More sensing modalities The dataset includes occasional measurements from sensors that we did not yet utilize in our experiments, including magnetometer, ambient light, air pressure, humidity, temperature, and watch-compass. Semi-supervised learning The ability to improve a model with plenty unlabeled examples will enable collecting huge amounts of data with little effort (less self-reporting). Active learning Active learning will make future data collections easier on participants - instead of asking for labels for many examples, the system can sparsely prompt the user for labels in the most critical examples. User adaptation In Vaizman2017a (referenced below), we demonstrated the potential improvement of context-recognition with a few days of labeled data from a new users. Can you achieve successful user-adaptation without labels from the new user? Feature learning All our experiments were done with designed features, using traditional DSP methods. Feature learning can potentially extract meaningful information from the sensor measurements that the designed features miss. The dataset includes the full raw measurements from the sensors and enables experimenting with feature learning. Privacy The ExtraSensory Dataset can be a testbed to compare methods for privacy-preserving. *Cite this paper if you use the ExtraSensory Dataset for any publication! *The supplementary material for this paper explain how we processed the labels to introduce the "missing label information". *Cite this paper if you use the ExtraSensory App for any publication! ".